My friends. Winter is coming. I dread it long before I come to accept it as a fact of life, and I often get so wrapped up in preparing for winter that I forget that nature is throwing a pre-winter party and we’re all invited. Camping in the fall is one of the best ways to make the most of the spectacular autumn scenery, secluded trails, and bug-free living. And there’s no better place to go camping in the fall than New England. 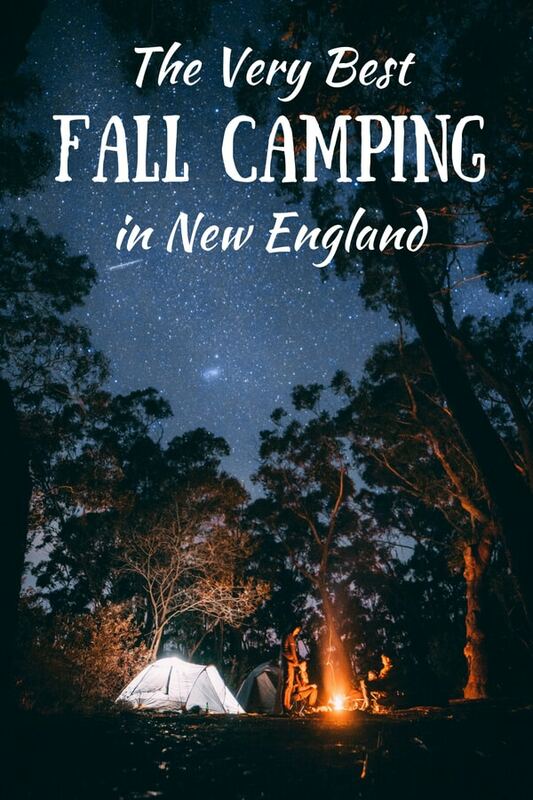 Now is the perfect time to book your fall camping trip in New England, before frigid, damp nights send you running for the nearest woodstove. Even if you live for warm, starry nights, fireflies, and smoky campfires, you can revel in this short, sweet season. These awesome spots provide some of the best camping in New England. They are so special that they attract throngs of people all summer long. Come August or September, when the kids go back to school, you’ll find blissfully quiet campsites, cool nights that just beg for a campfire, and autumn leaves that crunch underfoot as you hike miles of secluded trails. 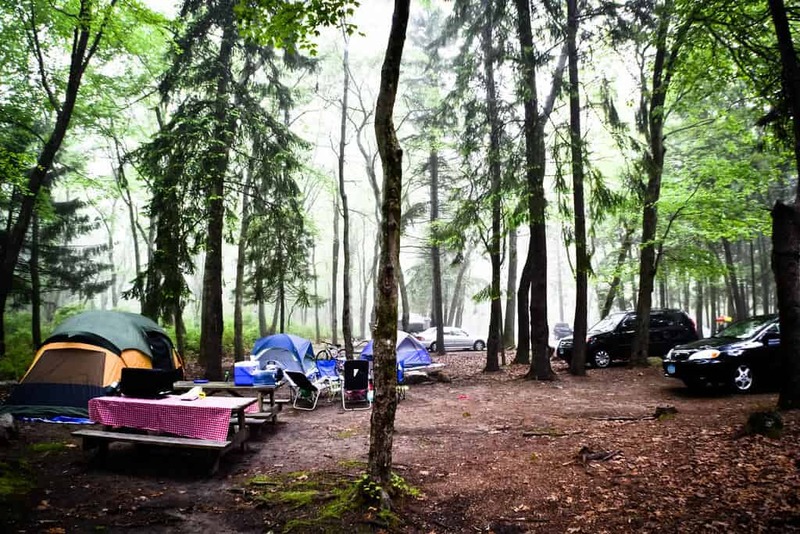 Don’t wait to reserve a spot at one of these lovely New England Campgrounds. A late season stay will help fuel your outdoor dreams until the last vestiges of snow have melted into another spring. Brighton State Park is one of Vermont’s most secluded and remote state parks. Located near Island Pond in the spectacular Northeast Kingdom, it’s a magical escape from the stresses of the modern world. Fall camping is special at Brighton State Park. Not only are the colors beyond gorgeous, but you can rent a cabin, move in for the weekend, and disappear from reality. Hike the trails that hug the shores of Spectacle Pond before delving deep into the dark and mysterious Boreal Forest. Rent a kayak and tool around the silent glacial pond before heading back to camp for an autumn fire. 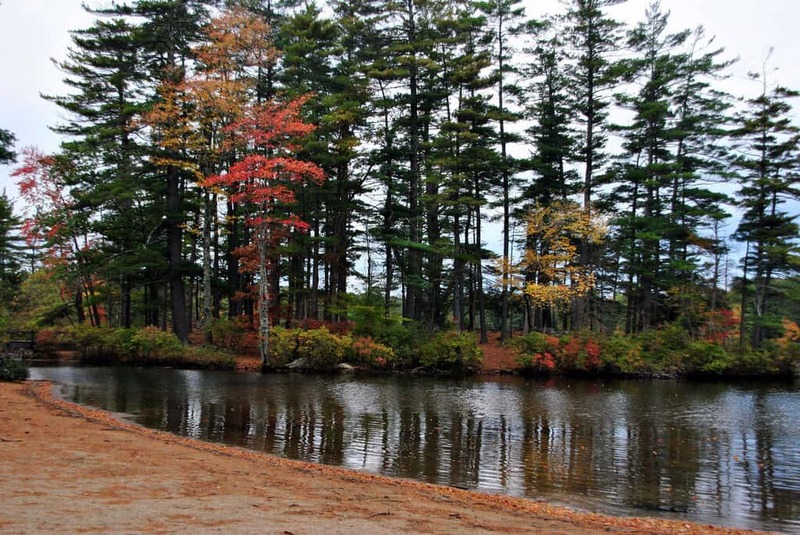 Brighton State Park is open for fall camping until Columbus Day. Our favorite thing about Brighton State Park: It’s really quiet, even during Vermont’s fall-foliage season. Something to consider: Fall camping is cold up here. Consider renting a cabin or packing your long-johns. Another special park with incredible scenery and very few people, Woodford State Park is also one of the most dog-friendly parks in the state. Treat your canine companion to a serious hike round the lake, or rent a canoe and explore the quiet coves and wetlands. If the fickle fall weather won’t cooperate, you can rent one of four cozy cabins, or you can brave the elements at one of the sweet waterfront campsites. Woodford State Park is open for camping until Columbus Day. Our favorite thing about Woodford State Park: We saw a moose!!! Something to consider: The trails can be muddy. Be sure to bring sturdy footwear. Burlingame State Park has a huge campground with more than 700 campsites, but in October you’d never know it! Located in Charlestown, Rhode Island, this sprawling park covers 3,100 acres surrounding Watchaug Pond. Feeling brave? It’s not too late to get in that last swim of the season. You can also rent canoes and kayaks for a small fee. Right next door, you’ll find the Kimball Wildlife Sanctuary, a lovely little preserve with a plethora of songbirds and nice hiking opportunities. Burlingame State Park is open until Columbus Day. What we love about Burlingame State Park: There’s an arcade and a playground, and the camp store is open late if you run out of marshmallows. Something to consider: We love Burlingame for fall camping in New England, but if you go in the summer, it’s really busy and also very loud. Pawtuckaway State Park, NH by Angela N.
Pawtuckaway State Park encompasses beautiful lake surrounded by colorful hardwoods and serious hiking trails through woods, up mountains, and across meadows. There are 192 campsites, and better yet, cabins with electricity. Pawtuckaway State Park is open through early November and is less than an hour from the coast. While most people visit during the summer for fun on the beach and in the water, you will love hiking and camping in the fall. The mosquitoes have disappeared, and all you can hear are the leaves crunching dramatically under your boots. What we love about Pawtuckaway State Park: The view from the fire tower is pretty amazing. Something to consider: Quiet hours are strictly enforced, so if you’re looking for a party, you might want to look somewhere else. Berkshire Vista by Ogden GigliHiking is the big draw at Savoy Mountain State Forest. There are trails everywhere – to waterfalls, up mountains, and around bogs, ponds, and lakes. You can hike 50 miles of trails from the campground, which is in the center of the expansive forest. The campsites are sunny and secluded, thanks to well-maintained, but wild hedges that circle around the sites. Cabins in Savoy Mountain State Forest are open year-round, but the rest of the campground closes on Columbus Day. What we love about Savoy Mountain State Forest: The hike to Tannery Brook Falls is beautiful in the fall, especially if there’s been lots of rain. 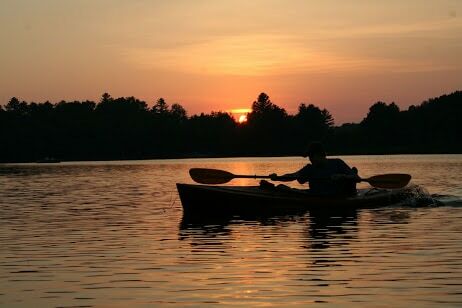 Something to consider: There are several ponds and lakes for kayak or canoe exploring, but you’ll have to bring your own boat. Rentals are not available. For the best of the mountains and the coast, you can’t beat Camden Hills State Park. The highlight of the park is the spectacular Mount Battie. 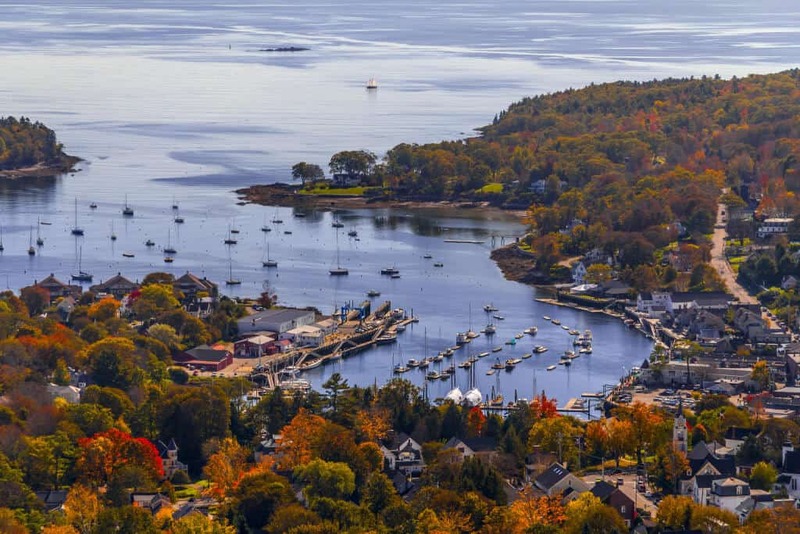 An easy climb will take you to the top in no time, and you’ll be lavishly rewarded with views of Camden Village and the expansive harbor beyond. And speaking of Camden Village, it’s just about the most charming fishing village you’ll ever lay eyes on. You can explore boutique shopping, visit a working harbor, and eat some pretty amazing seafood – all on the same block. The village is just a few miles from the park, so you can have the best of both worlds — total seclusion or seaside tourism. What we love about Camden Hills State Park: The hiking is seriously awesome, and the campground has free Wi-Fi if you need it. Something to Consider: Camden Hills State Park is open year-round! 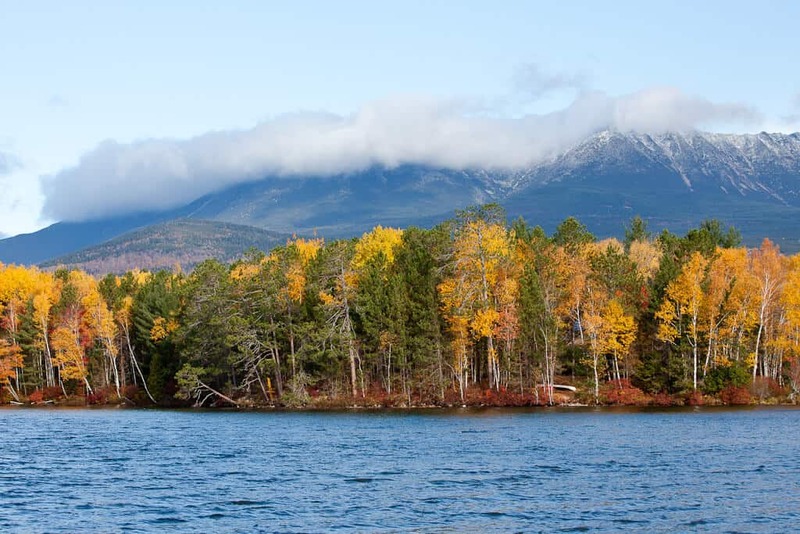 A year-round campground in one of Maine’s most iconic, but secluded parks, Daicey Pond Campground is open year-round for an incomparable wilderness experience. Hike to incredible vistas, fish in mountains streams and boggy ponds, and catch your Zzz’s in a cozy cabin, complete with a woodstove for heat, and propane lights. The Appalachian Trail runs through the campground on its way to the northern terminus on Mount Katahdin, and there are 200 miles of wilderness trails throughout the park. This is true wilderness, so don’t be surprised to come upon deer, moose, bear, and lots of smaller critters. What we love about Daicey Pond Campground: Cabin #9!! Something to consider: There is no potable water, so be sure to bring a filter so you can drink from the pond. Fall is the most underrated, yet beautiful time for a camping vacation. 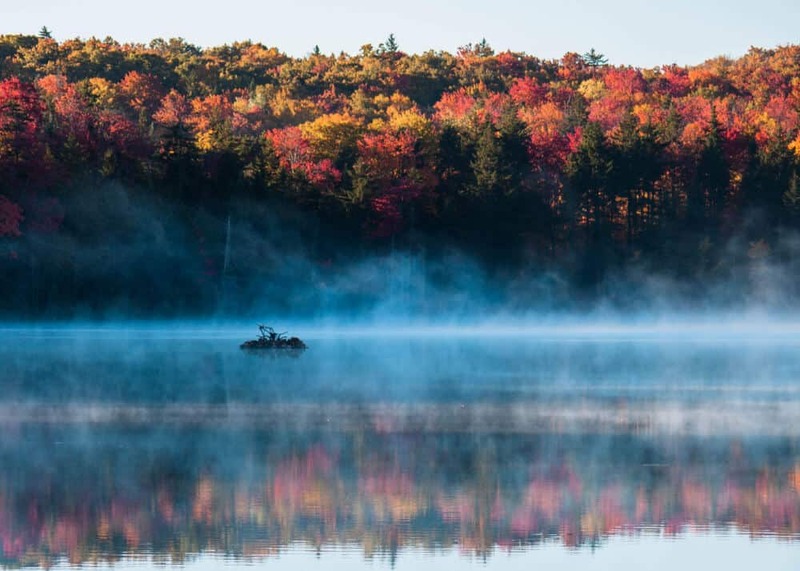 There are no crowds to mar your quest for Thoreau-inspired adventures, and the spectacular, New England fall foliage will tide you over until wildflower season at least. Camping in the fall isn’t for everyone, but it may just be for you. Here are a few tips to make your New England camping trip extra special. Pack lots of layers – Fall is a fickle season in New England, and you will likely experience crisp, sunny days and cold nights. Frosts or very common starting in September. Be sure to pack lots of layers to keep yourself warm and cozy, and stay away from cotton, which is a terrible insulator. Instead opt for wool or capilene, which both dry quickly and will keep you warm. Book a cabin – Many of the New England campgrounds mentioned above have options for cabin camping. If sleeping in a tent on the cold ground isn’t your thing, consider cabin camping. Many of the New England cabins mentioned in this article are available year-round, which means the fun doesn’t have to end in the fall. Make sure you have cold-weather gear – You will need a sleeping bag rated at 5-30 degrees for fall camping in New England, and a three-season tent. A sleeping pad is a must in the fall, and you should ideally bring one with an R-value of at least a 4. Keep yourself busy – While summer camping trips are meant for leisurely mornings, afternoon swims, and evening board games, camping in the fall calls for more physical activity to keep you warm. 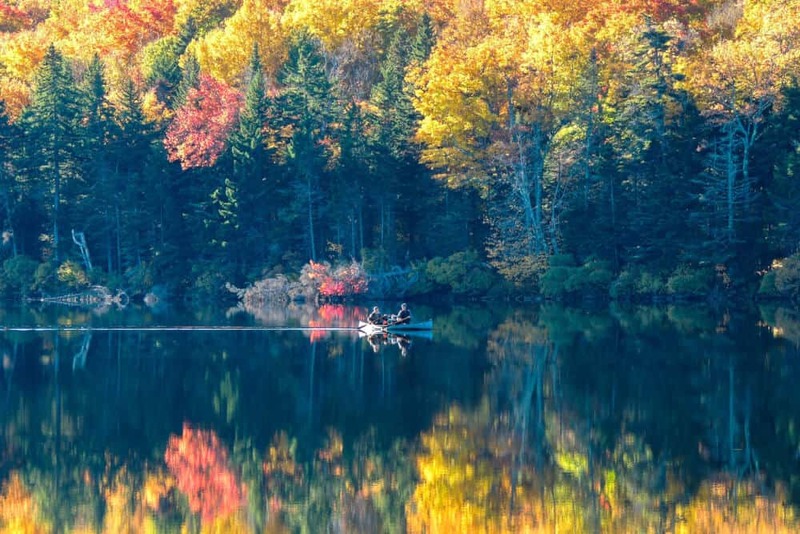 Brisk hikes and paddles are great ways to spend the day, and don’t forget your camera – the New England fall foliage is pretty spectacular. Do you have a favorite New England camping spot? Please share it with our readers! 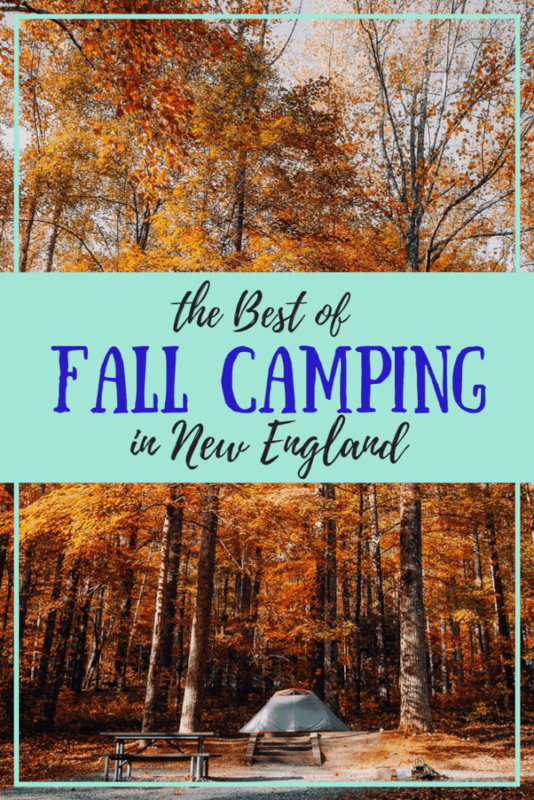 Did you enjoy this post about fall camping in New England? Pin it for later! I love the place in Autumn 😀 I will definitely put this in my list of coming-back places this 2018 😀 Great info! Great Blog! Thanks! Hi, awesome article. I really love the outdoors, fishing, hunting and camping. Folks spend way too much time inside watching the TV. Thanks for sharing and providing an inspiration. Great post. Thanks for the list of amazing new places to explore. You’re welcome, Chris. Happy adventuring! Thanks for the info. The New Hampshire State Pk site led me to open parks which were not showing up elsewhere. Hope Oct 5 is not too late to start from NC. Will focus on Whites, Greens, Adirondacks. I think you’ll be fine. In most cases you have until Columbus Day, which is around peak foliage anyway. Enjoy your trip! Beautiful Places! I’d like to camp in New England. You are right, just before winter sets in, Nature seems to tease and and enchant you with the colurs of Fall, as if inviting you to revel in its beauty before it gets shrouded in a white blanket. These are absolutely enchanting places to camp in Fall and bask in the glory of nature. I love camping and spending some time in nature. All those places look absolutely breathtaking, especially the Woodford State Park. Summer very much figures in to my camping plans – a great time to pitch a tent and enjoy the outdoors 🙂 Scenery here looks idyllic and the perfect place to do it! Wow, so many stunning options! Difficult to decide which one, maybe all? I particularly loved Camden Hills State Park! Thanks for stopping in. I’m so happy to have found #MondayEscapes and all the awesome blogs that are linking up. So so beautiful!! I only know New England from tv but I’d really like to visit – especially in autumn!! I think the beauty of fall is so stunning so that it is blazed into our memories during the long winters. I really enjoy camping but I have never had the pleasure to do it in New England. All the places you have pointed out in here look so beautiful. I can imagine myself waking up surrounded by colorful trees. It’s a more tame wilderness, Ruth, especially if you’re used to the grandeur of the western states. The beauty is in the details I guess. Thank you for stopping in, Liz. The colors are amazing here in the fall, and it’s so helpful to be away from home to appreciate it. That’s why we love camping so much!